Everyone’s seen the articles on best practices for running a Facebook contest with tips like “decide what type of contest to run” and “choose a third party app”. Umm those aren’t really tips. Those are either recommendations that are already common sense or just plain ol’ directions on how to run a contest. But not tips. 1) Get the ball rolling by entering some of your own example content into the contest. We don’t mean cheating. But if you’re running a photo contest or something similar, having friends and family enter the contest with photos that you took (of course these people won’t qualify to win) gives you the chance to show users what kind of entries you’re wanting in the first few days of the contest. Plus it gets your fans excited to see other people entering and may encourage them to enter as well. My boss likes to call this “priming the pump”. I don’t call it that because it sounds silly. 2) Let the fans vote for the winner. When you allow the fans to vote for the winner of your contest rather than choosing the winner yourself, you open up the opportunity for fans to spread the word about your contest and business by sharing posts and asking their friends and family to vote. There’s a good chance those friends and family are visiting your page for the first time to vote and may like your page while they’re there. 3) Create posts to highlight fan entries. 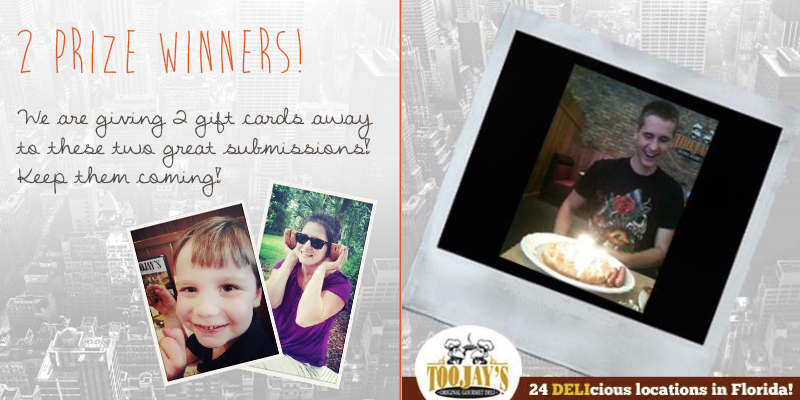 Everyone likes to be told how awesome they are, so choose a few entries to highlight in a post. Maybe it’s a photo of the day or week. Maybe it’s a collage just to show off great entries. Whatever works for you. When you put out posts about your contest, make sure you spend a few bucks to promote the post so more people see it. Promoting a post for a Facebook contest will drastically improve the number of people you’re reaching and probably get you more shares, which, in turn, will help you reach even more people. Shares! Comments! Likes! Hooray! BONUS TIP: Depending on your budget and how large your contest is, reach out to all contestants after the contest and surprise them with a small prize just for entering. Perhaps a $5 gift card or a free cookie etc…. 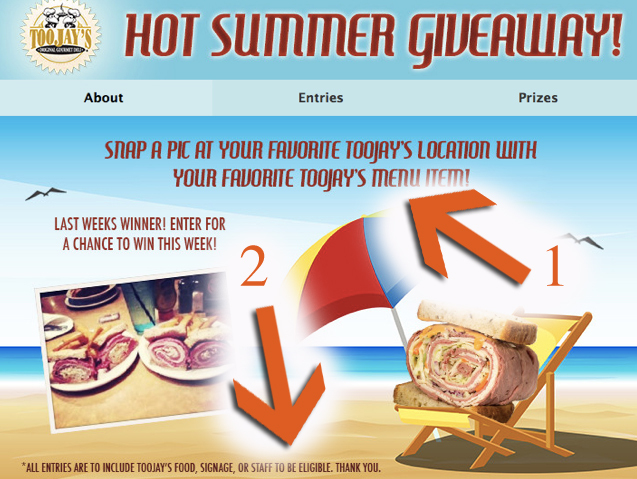 There’s a good chance you’ll entice all those fans to enter your next contest and tell even more people how sweet your business is. 1) If you’re running a contest for a business with a physical location, make sure that there are fliers or posters to promote the contest in a visible spot around your business. Not all of your customers/clients use Facebook or like your page on Facebook, so they may never find out about the contest in the first place unless you have it plastered in multiple places. Also, don’t be afraid to ask your employees to mention the contest to customers or have a message printed on receipts. 2) Use multiple social media platforms to promote your contest. Some people like to use Twitter more than Facebook. Others prefer Google+ or Pinterest. Make sure you reach these fans too by tweeting/posting/pinning about your Facebook contest on these platforms and giving them a link to the contest landing page. This can also help bring you new fans. For instance, if a user was following you on Twitter but hadn’t yet liked your page on Facebook, they may take time to do so now. 3) Be overly (and obnoxiously) clear about the rules/guidelines. People on social networks tend to avoid reading lots of text (kudos to you for liking to read). So they skip things and decide that they understand the gist of your contest. But then they end up entering random photos of themselves at the beach or a birthday party into your contest when the rules specifically state that the photos must include your product. To prevent this from happening, post the main rule of your contest everywhere. IN LARGE PRINT. 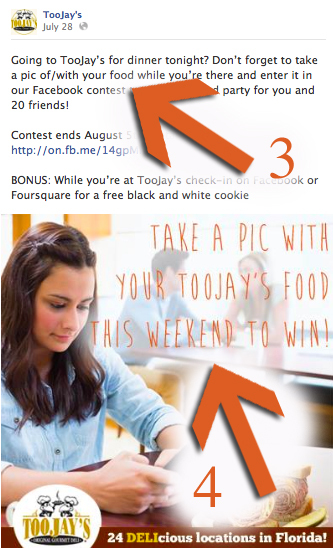 Example: TooJay’s only rule to their photo contest was that the picture had to include TooJay’s food or the person at a TooJay’s restaurant. After seeing the first few entries come in, we realized people weren’t reading the contest rules. To solve that problem we plastered our one main rule EVERYWHERE. On all pages of the 3rd party platform. On every single post about the restaurant Facebook contest. We even included it in the photoshopped Facebook cover photo and main contest image. WE WILL MAKE YOU READ THE RULES! Don’t forget to tell us when you run your Facebook contest so we can win stuff! That first tip is something one should definitely do when running a contest. Of course, as said in the article, don’t allow them to win. If you let yourself win you will probably get some bad publicity for it.